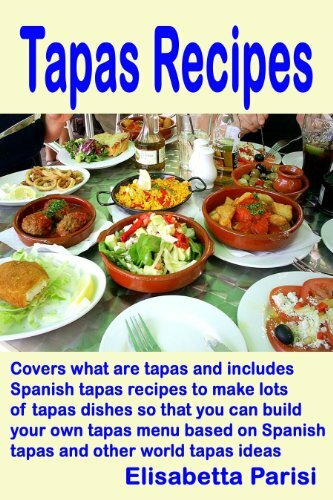 The word 'tapas' is derived from the Spanish 'tapar', a verb meaning 'to cover'. Tapas were, and are, commonly served in bars throughout Spain. The Spanish tradition of serving tapas is thought to have started when drinkers would place a slice of bread or ham on top of their wine glass to keep out insects. This extended to adding cheese, olives, tapenade, etc to the base. Toothpicks were used if necessary to hold the ingredients in place. This 'edible lid' now takes the form of a wide variety of small appetisers or snacks which are served with drinks. Tapas may be warm or cold. Mixed olives and cheese may form a simple cold tapas or items such as chopitos (battered, fried baby squid) may be served warm. 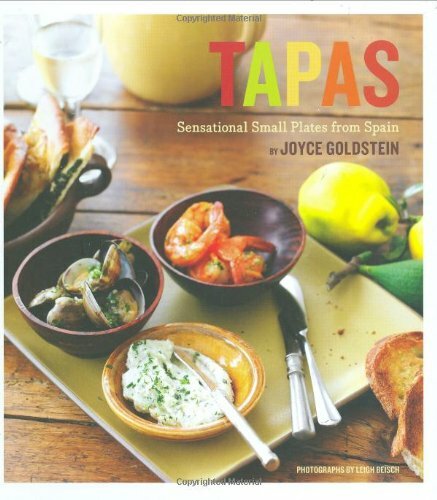 Tapas have evolved into an increasingly sophisticated cuisine. When serving tapas to friends try cured meats and olives served on a bread board or you might like to prepare something much fancier. One dish which will enhance your reputation as a host is Patatas Bravas which is a basic and traditional tapa often accompanied with a shot of orujo or a glass of wine. You will need a finely chopped small onion. Place the onion in a saucepan with three tablespoons of olive oil. Saute over low heat until the onion is soft. Add 2 cloves of finely chopped garlic, 1 tablespoon of tomato puree, 2 teaspoons of Spanish paprika, 1 finely chopped chilli and a pinch of sugar. Bring to the boil and simmer for around 12 minutes. By now, the mixture should be of pulp consistency. Season to taste and set aside. Peel 750 grams of potato, cut into 2cm chunks and blanch for 5 minutes in boiling water to which a pinch of salt has been added. Strain and set aside to cool. Once the potatoes are cool, shallow fry them in olive oil until golden brown. Toss with the warm sauce, season to taste and garnish with chopped parsley. NB: Royal Blue or Russet potatoes are recommended for this dish. Cherry Tomatoes stuffed with Spanish Olive Tapenade are another great tapas dish. You will need a food processor. Place ½ cup Spanish olives with pimento in the processor and pulse until finely chopped. Add 1 ½ teaspoons drained capers, ¼ teaspoon lemon zest, 1 ½ tablespoons extra virgin olive oil and a dash of brandy and pulse again until the texture is like mince. Then remove the top and bottom of small cherry tomatoes. Remove the seeds then spoon the tapenade mixture carefully into the tomato shells. Garnish with parsley. If you're into chick peas, you'll enjoy the following – and so will your guests. To make Chick-peas and Spinach Tapas you'll need about 10 ounces of fresh spinach leaves. You can use a packet of frozen spinach if you wish. Cook the spinach, drain, squeeze dry and chop finely. Place in a mixing bowl and add a 19 ounce can of drained and rinsed chick-peas (about 2 cups if you want to cook your own), a finely diced red capsicum, juice of 2 lemons, a tablespoon of chopped fresh chives, and 1/3 cup of extra-virgin olive oil. Season to taste with freshly ground sea salt and black pepper. Serve with toasted bread or use as a filling for tiny pastry cases or French sticks. This sounds yummy. Great article! Believe me, it IS yummy. Thanks for the comment.